Explore Numeria, the land of super-science, with the Iron Gods Poster Map Folio! Pore over masterful cartography and plan countless adventures with these three massive poster maps designed for use with the Iron Gods Adventure Path. These huge, lavishly illustrated poster maps depict locations found in the Iron Gods Adventure Path. The first map explores the strange but industrious town of Torch (the setting for the first volume of the Adventure Path). The second map shows Starfall, Numeria�s capital, which stands in the shadow of Silver Mount. The third map is a giant, player-oriented illustration of the nation, presented as an ink-and-parchment drawing of this land of technology and superstition! 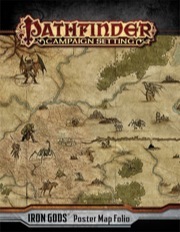 Whether you�re looking for a town in which to begin your adventures, a sprawling industrial city, or a land of robots and alien beasts, these beautiful maps are the perfect resource for the Iron Gods Adventure Path or any fantasy campaign..